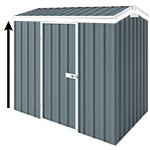 Skillion roof models offer you extra head room at your shed front and added depth, compared to flat roof sheds. This gives you additional storage space yet still remain compact enough to fit into small backyards. This shed manufactured by Durabuilt Products and come with 20 years warranty. Please check out the wide range of accessories available with this model below to customize it to your needs.